Downloading images from Google Images search can be a time consuming and DANGEROUS process. On more than one occasion, while trying to save the full size image and being forced to the originating website, I have accidentally come across malicious websites. Because of this, a tool is required to keep from having to visit sites to obtain the original image. I spend a lot of time looking for a good tool that would take care of this for me. 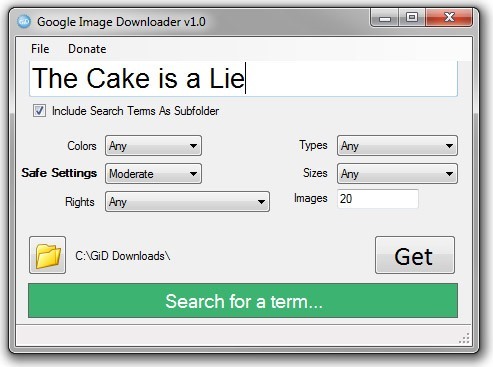 The best tool I have used in terms of features and usability is Google Image Downloader. 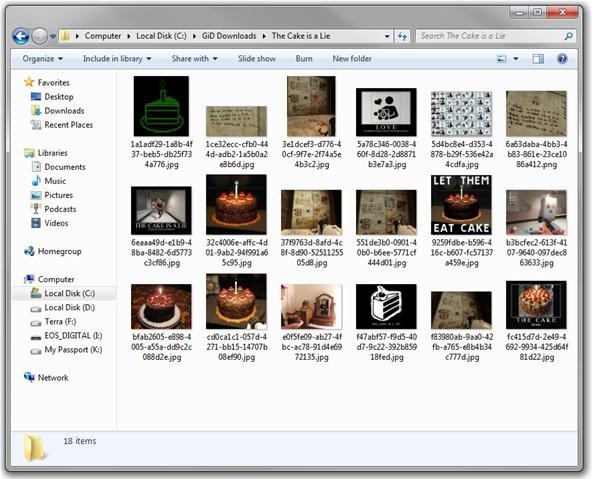 Google Image Downloader (GiD) allows you to download images by entering a search term. It then hits the Internet and downloads the full-size images from all of the sites Google Images returns. So what does this mean to you? You don't have to worry about going to malicious sites to get your image. You automatically get up to 2000 images per search. You can use filters, just like in Google Images. 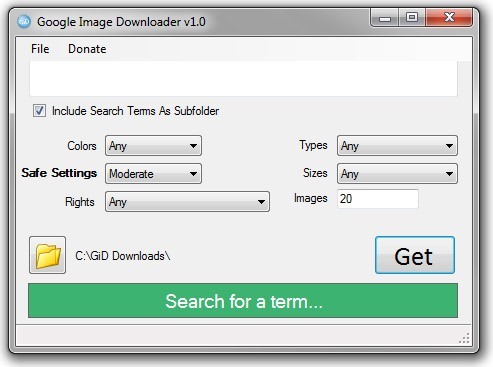 Download and Install Google Image Downloader from the GiD official site. Set your options, such as Safe Settings and the download location, then enter a search term. The following screenshot shows what it looks like after a search term is entered. Finally, navigate to the folder you set (in Step 3). Alternatively, you can double-click on the text to the right of the folder icon and it will take you to that folder automatically. You cannot view the images before downloading. GiD will automatically download the first results within your defined settings. You will not actually be able to view the images until after downloading to your set folder.